This is one of my favorite recipes. This is my go-to meal, and with school coming up, I wanted to take a minute and share. I usually make a vat of this on Sunday, so that during the week, I can get a hot and delicious meal on the table. This week, I am going to be providing you with a complete meal, and a shopping list. Here is a printable shopping list, it has everything, even salt, and pepper, so take a look out and see what you have on hand because you don’t need to buy everything on the list, just the things you need. 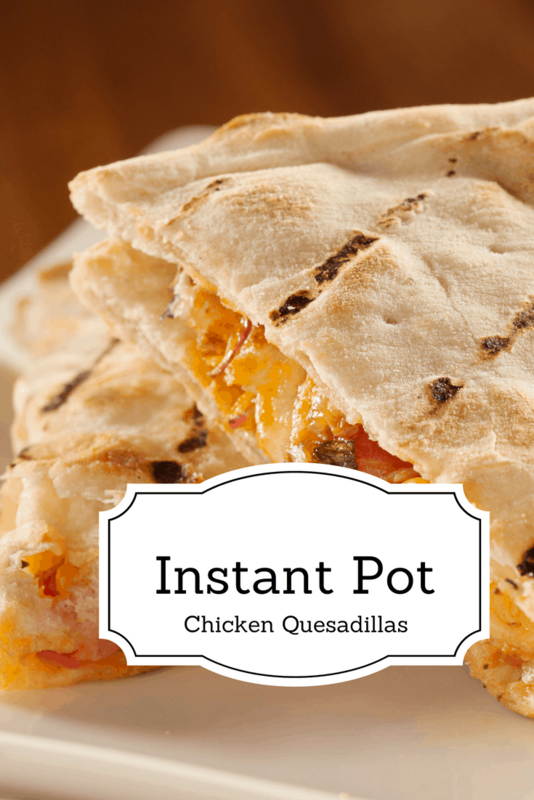 Place all of the ingredients into the Instant Pot, make sure that the chicken is covered in sauce. When the time is up, let it naturally release. Then, when it's done, shred the chicken, using two forks. Mix the shredded chicken in the sauce, and then hit saute, let it cook for about 3 minutes, make sure to mix it, while it's cooking. Then in a small bowl, mix the two cheese together. Then get your flour tortilla, add your shredded chicken and top with mixed cheese, and then cover the cheese with another flour tortilla. Now, you can either microwave it for about 30 seconds, until the cheese melts, or you can add a tablespoon of butter to a large skillet and brown it for about 3 minutes per side.